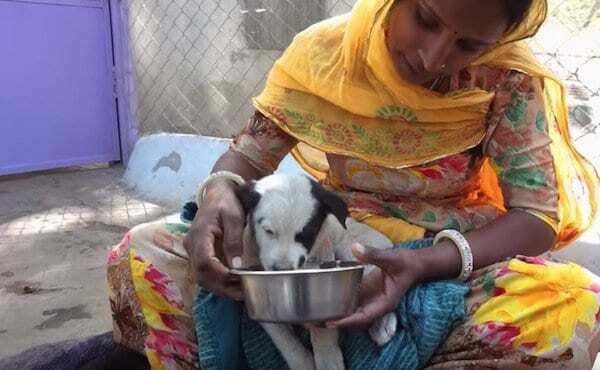 Animal Aid Unlimited is an animal rescue group working out of Udaipur, India. This group has saved countless stray animals who had no one else to turn to. In February 2019, the rescue group performed another stunning rescue. 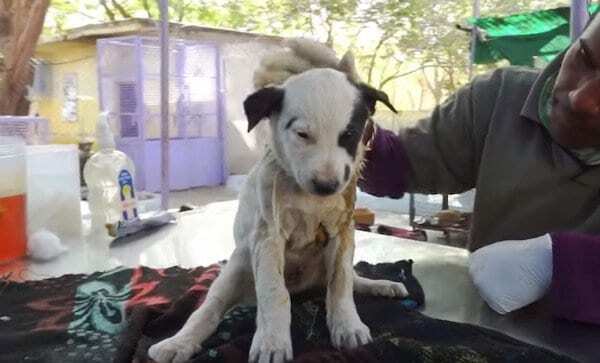 This time, the group saved a badly wounded puppy who desperately needed medical attention. Animal Aid Unlimited received a call about an injured puppy lying on a street corner. When they got there, they saw that his mother was standing next to him. The mama dog was crying out for help. 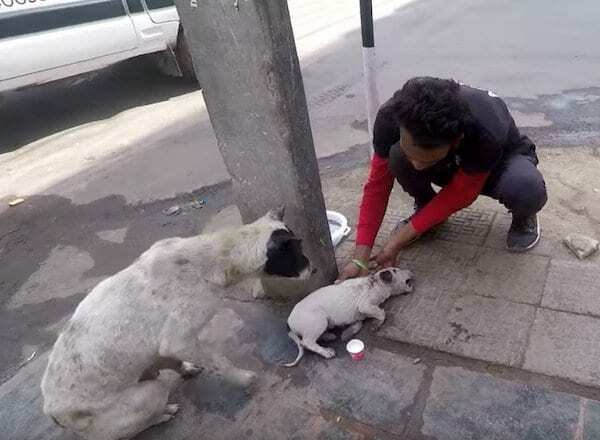 The rescuers carefully approached the mama dog and her son, trying to show the mother that they wanted to help her puppy. “She didn’t stop trying desperately to communicate as we gently lifted her puppy who had two deep wounds and placed him in the ambulance,” Animal Aid Unlimited wrote on YouTube. 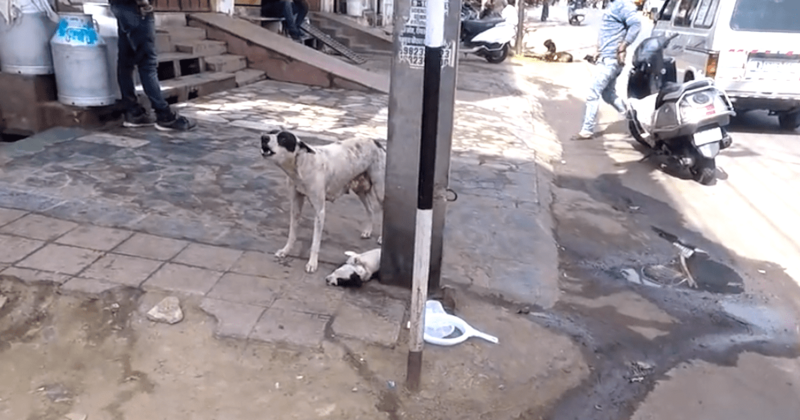 The mama dog seemed to realize the rescuers were there to help—she let them approach the puppy and touch him. It was clear the puppy needed to see a vet, and so the rescuers brought him into their van. They couldn’t take the mama dog with them—she had four other puppies to look after. “We would try our best to save her sweetheart and bring him home, and how we wished and hoped she would somehow understand,” Animal Aid Unlimited wrote. When the rescuers got to their shelter, they immediately took the puppy to see their vet. The vet stitched up the puppy’s wounds and cleaned him off. The puppy was quiet and calm during the procedure. The rescuers decided to name the puppy Toggle. In the days after the surgery, the puppy struggled to walk, and the rescuers worried that his nerve damage was permanent. But Toggle was a determined little puppy, and slowly but surely, he learned how to walk again! Once Toggle was fully healed, the rescuers took him back to his family. They were sad to see the sweet puppy go, but they knew he belonged with his parents and siblings. Animal Aid Unlimited filmed the heartwarming reunion between Toggle and his mother. Both of the dogs were so excited to see each other! Animal Aid Unlimited says they’re going to keep an eye on this happy little family, and they plan to spay the mama dog when the puppies are a bit older. We’re sure Toggle will be happy to see his rescuers again. Toggle’s mother was determined to get help for her puppy, and she refused to stop crying out until the right person answered her calls. If you want to learn more about Toggle’s rescue, check out the video below.